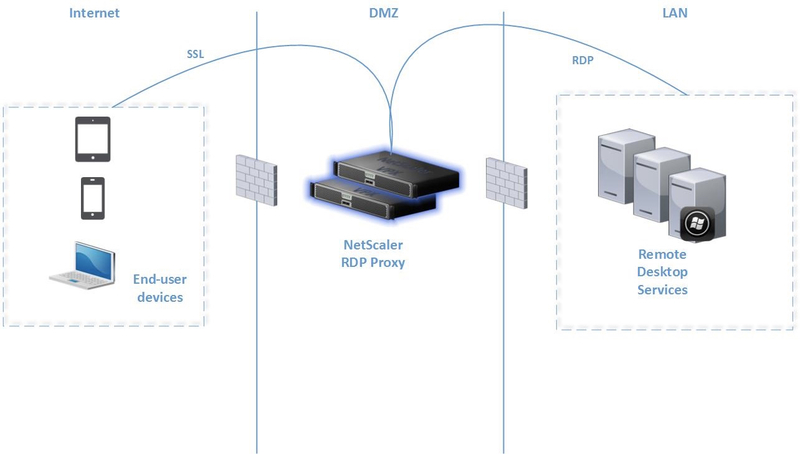 A really cool feature which was introduced in NetScaler 11 is the RDP Proxy feature. A Use Case I see very often, is a company who e.g. has external consultants that need secure access to an internal RDS Session Host Server in order to support a specific business environment. This scenario eliminates the need of having distributed VPN Clients and/or firewall rules to manage the RDP traffic. This allows us to “publish” RDP links from our NetScaler Access Portal. Providing access to an internal hosted RDS Session Host. When a client (Typically Windows or MAC) launches a RDP shortcut from our NetScaler Portal a RDP connection is made from Client to NetScaler Gateway tunneling RDP inside SSL 443, and from NetScaler Gateway a backend connection on RDP 3389 is made towards the RDP Session Host, eg. Windows Server 2012 R2 / 2016 / 2008 R2. Note that this is NOT a replacement of the Microsoft RDS Session Broker functionality with delivery of Windows Remote Apps. We “only” Publish a Full Desktop to our end-users in this case. 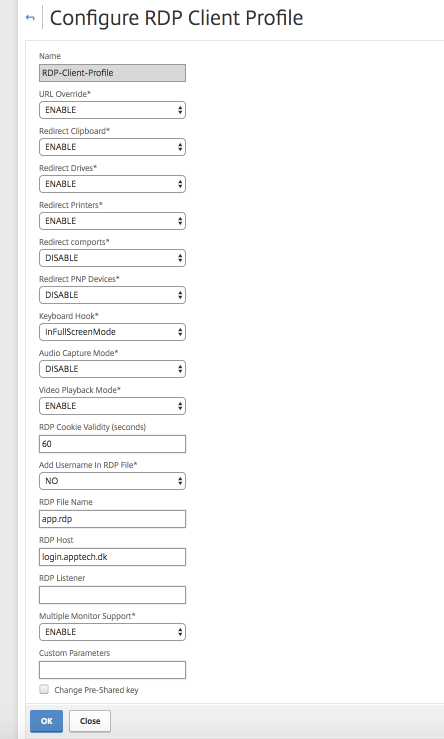 add rdp clientprofile RDP-Client-Profile -redirectDrives ENABLE -rdpFileName app.rdp -rdpHost "NetScaler Gateway FQDN"
Remember this need to match the exact name as in Active Directory, furthermore NetScaler LDAP policy needs to do LDAP Group Extraction. add vpn url "RDP APPSRV01" "RDP AppServer01" "rdp://appserver01.demo.local" -clientlessAccess ON -iconURL "/logon/RDP.ico" add vpn url "RDP APPSRV02" "RDP APPSRV02" "rdp://appserver02.demo.local" -clientlessAccess ON -iconURL "/logon/RDP.ico"
add vpn url "RDP APPSRV01" "RDP AppServer01" "rdp://appserver01.demo.local" -clientlessAccess ON -iconURL "/logon/RDP.ico"
add vpn url "RDP APPSRV02" "RDP APPSRV02" "rdp://appserver02.demo.local" -clientlessAccess ON -iconURL "/logon/RDP.ico"
bind aaa group RDP-Access -urlName "RDP APPSRV01" bind aaa group RDP-Access -urlName "RDP APPSRV02" bind vpn vserver nsg_login.demosite.dk -urlName "RDP APPSRV01"
bind aaa group RDP-Access -urlName "RDP APPSRV01"
bind aaa group RDP-Access -urlName "RDP APPSRV02"
bind vpn vserver nsg_login.demosite.dk -urlName "RDP APPSRV01"
Note. This is a Global Parameter – be cautious doing this in an already established production environment! Bind the traffic policy to AAA Group or NetScaler Gateway Virtual Server.